How does the Platy.cz website work? Platy.cz is a website where you can get a comparison of the salaries of about 500 positions. The list of positions reflects the labour market in Slovakia and is constantly updated. This salary survey was launched in 2007 as Merces.cz. Profesia, spol. s r.o. is the author of the methodology concerning the acquisition, collection and processing of the data gathered in the survey, and its subsequent evaluation. The target group of the portal are people in the labour market who want to compare their salary, and companies who pay attention to fairly setting employee salaries. People in the labour market can get a comparison of their salary with other employees in the same position and region. Everyone who completes the questionnaire with 14 questions (8 of which are compulsory) becomes a respondent, and receives a free salary comparison with the average of the reference sample. This is created by other respondents according to the position and region filled in the questionnaire. The data from each respondent are valid for one year, and there is no interference with the information entered in any way. All data in the salary survey are anonymous. Prior to actual calculations, the sample data is cleaned up. Errors such as negative numbers, extreme values ​​(e.g. CZK 1 / month or CZK 10 mil. / month are filtered out first. The second step in cleaning the database is to detect duplicate questionnaires and to determine extremes. Extremes are determined specifically for a particular position with regard to the region (Prague region, outside the Prague region). The methodology for detecting extreme data (data trimming) is based on the robust estimations of parameters regarding the theoretical distribution of salaries in a particular position by region. Data from the questionnaires that have undergone cleaning are used in the calculations. we never estimate salaries in one region according to another region. For a more vivid understanding of the results of salary comparisons, we also provide their graphic representation. 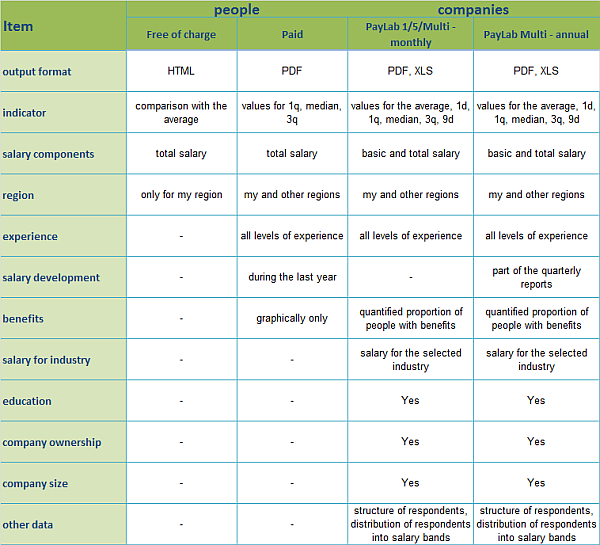 For each group of people the corresponding questionnaire is displayed, and after its completion the outputs with a basic comparison of actual or anticipated salary are shown. Outputs are displayed directly on the website, but can be downloaded in PDF format. Each visitor can purchase an extended paid version of the output that provides a more detailed salary comparison based on the median and quartiles. This output also provides an overview of salaries by region and experience, and a summary of benefits provided for the particular position. The paid version of outputs also gives hints and tips on how to negotiate a salary, training for staff SWOT analysis, glossary of terms, etc. Visitors can purchase the paid report with SMS payments via all three mobile operators operating in Czech republic, bank transfer through the TrustPay payment system and its cooperating banks and through PayPal. The purchased personal salary analysis is sent to the email address provided by the visitor by email. The Platy.cz salary survey provides business customers with PayLab labelled products. When buying any PayLab product (except Analyse) the client receives, in addition to PDF output, access to a tool that allows working with the information database for the purchased position. During the service period, the client can work with a tool to generate outputs for the position with various criteria for a particular region, sector, company size, employee education, and so on. - recommendations for employee salary adjustment. - values ​​for the salary average and percentile according to all regions, education, experience, company size and ownership. Multi PayLab clients with one year validity also receive a quarterly salary report in the industry where they operate. This is a PDF document that displays a salary comparison in a selected state and industry. It provides quarterly values of the average salary for positions with inter-annual salary comparison and inter-annual comparison of benefits in the industry.